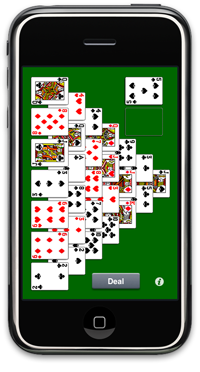 This is an iPhone/iPod touch version of the famous Pyramid Solitaire card game. The objective of this game is to clear all the cards by eliminating pairs of cards that total 13. Kings are discarded as a single card. Only uncovered cards in pyramid and top cards of the stack / waste are available for play. 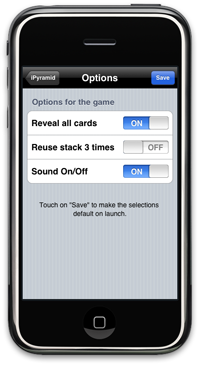 Single touch to select a card, another touch to deselect it. As an option, wasted cards can be reused 3 times. Also, all the cards can be revealed as well.